More than 3000 New Zealand military and civilian personnel served in Vietnam between 1963 and 1975. In contrast to the world wars, New Zealand’s contribution was modest. At its peak in 1968, New Zealand’s military force numbered only 548. Thirty-seven men died while on active service and 187 were wounded. Two civilians serving with the surgical and Red Cross teams also lost their lives. The Vietnam War − sometimes referred to as the Second Indo-China War or the American War − lasted from about 1960 until 1975. Fought between the communist Democratic Republic of Vietnam (North Vietnam) and the US-backed Republic of Vietnam in the south, it ended with the defeat of South Vietnam in April 1975. More than one million soldiers and perhaps two million civilians died during the war. This was the first war in which New Zealand did not fight alongside its traditional ally, Great Britain. Instead, our participation reflected this country's increasingly strong defence ties with the United States and Australia. New Zealand's involvement in Vietnam was highly controversial and attracted protest and condemnation at home and abroad. Few New Zealanders waved placards in the streets in 1965, but by the end of the decade thousands were marching against the war. For a growing number of New Zealanders, their country's participation in the conflict triggered a re-examination of its foreign policy and identity. During the first Indo-China War (1946-1954) between the communist-dominated Viet Minh and France, New Zealand accepted the British-American view that Vietnam was a crucial point on the front line against communist expansion in Asia. New Zealand joined its major allies in recognising the French-sponsored Bao Dai regime in 1950, but remained unsure about the strength and legitimacy of the non-communist forces in Vietnam. The end of this conflict coincided with a significant change in New Zealand’s approach to regional security. Following the French withdrawal and the Geneva conference’s ‘temporary’ division of Vietnam at the 17th Parallel, it became a founding member of the South-East Asia Treaty Organisation (SEATO), a regional alliance against the spread of communism sponsored by the British and (especially) the Americans. New Zealand focused its defence strategy on ‘forward defence’ in Asia – an attempt to keep communism as far away from its shores as possible. The second Indo-China War began as a civil war. From 1960, insurgents from the communist-dominated National Liberation Front – dubbed ‘Viet Cong’ in the south – fought a guerrilla campaign against a South Vietnamese regime that was now led by Ngo Dinh Diem. Backed by Ho Chi Minh’s North Vietnamese, the Viet Cong posed a serious threat to the southern government, which the United States increasingly bolstered with military and economic assistance. The New Zealand government resisted American pressure to contribute to the conflict because it doubted the effectiveness of external intervention and feared that this could spark a wider war, possibly with China. The struggle in Vietnam was part of a broader Cold War between the communist bloc headed by the Soviet Union and its former wartime allies in the West. New Zealand certainly saw the fighting in Cold War terms. While firmly committed to the Western Allies' policy of containing the Soviets, it was reluctant to become involved in Vietnam. Officials and politicians in Wellington had doubts about the prospects of success in defending South Vietnam. With substantial forces stationed in Malaysia (in Confrontation with Indonesia from 1963), New Zealand had few military resources to spare for Vietnam without introducing conscription. Despite its misgivings, the New Zealand government feared that a failure to contribute to the escalating conflict in Vietnam would compromise its 1951 ANZUS defence pact with the United States and Australia, an alliance on which New Zealand’s long-term security was seen to depend. In May 1965, Prime Minister Keith Holyoake announced that New Zealand would send a combat unit to join the United States-led coalition in Vietnam. Up until then, New Zealand’s contribution to the conflict had been restricted to humanitarian aid and development assistance: a civilian surgical team treating civilian casualties of war in Qui Nhon (1963-1975) and a 25-strong non-combatant engineer unit (NEWZAD) working on reconstruction projects in Binh Duong province (1964-1965). The first New Zealand troops into action were the gunners of 161 Battery, Royal New Zealand Artillery. On 16 July 1965, they fired their first shells near Saigon (now Ho Chi Minh City). Following the end of the Indonesia–Malaysia Confrontation, New Zealand came under renewed pressure from Washington to expand its commitment in Vietnam. In 1967, it sent two infantry companies – V and W – from the 1st Battalion, Royal New Zealand Infantry Regiment in Malaysia, along with a tri-service medical team – 1st New Zealand Services Medical Team. A Special Air Service (SAS) troop arrived the following year. New Zealand’s military strength in Vietnam reached a peak of 548 in 1968. 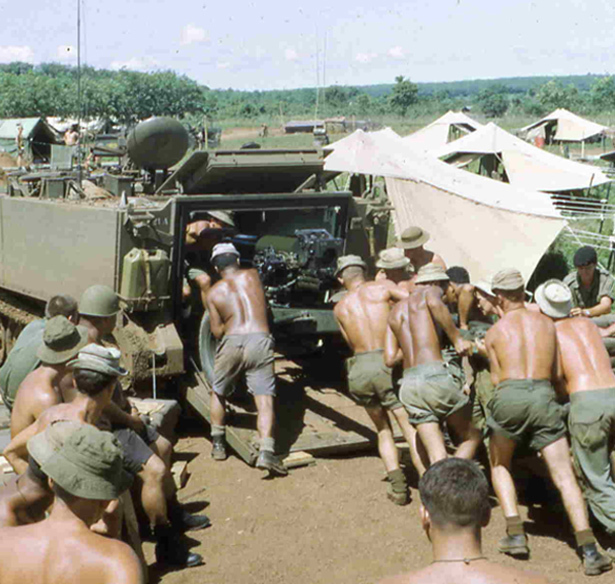 From 1966, New Zealand units were integrated within the 1st Australian Task Force at Nui Dat in Phuoc Tuy province. The gunners joined an Australian field regiment, the infantrymen formed part of an Anzac battalion and the SAS served with an Australian SAS squadron. Most operations in Phuoc Tuy were regular patrols or cordon and search operations. Large-scale actions such as the 1966 Battle of Long Tan were uncommon. From 1967, Royal New Zealand Air Force (RNZAF) pilots flew helicopters with 9 Squadron Royal Australian Air Force, while others operated as forward air controllers with the United States Air Force. RNZAF transport aircraft supported New Zealand forces in Vietnam throughout the war. As the training teams began their work, New Zealand progressively withdrew its combat forces, in line with reductions in American strength in Vietnam. All were gone by the end of 1971. In December 1972, Norman Kirk’s newly elected Labour government withdrew both training teams. By then, more than 3000 military personnel had served with New Zealand’s Vietnam (V) Force in Vietnam. All who served were regulars, or personnel who enlisted in the Regular Force in order to join V Force. Its small size meant that New Zealand, unlike its American and Australian allies, did not have to introduce conscription . Despite New Zealand’s modest military involvement in the Vietnam War, the conflict created enormous political and public debate at home about New Zealand’s foreign policy and place in the world. From the mid-1960s, an organised anti-Vietnam War movement challenged the whole philosophy underlying New Zealand’s national security policies, and the benefits and consequences of its alliances. The anti-war movement grew during the closing stages of the Vietnam War. 'Mobilisations' in the early 1970s saw thousands in major centres march in protest against the war. All New Zealand troops in Vietnam were volunteer regular personnel, so the protest movement did not have an anti-conscription edge, as it did in Australia and the United States. By the latter stages of the war, the anti-war movement had merged with other major causes – women's rights, the anti-apartheid movement – to spawn what some termed the ‘Vietnam Generation’. While the anti-war movement had little impact on New Zealand foreign policy, it did cause the National government to mount a detailed public defence of its stance on Vietnam. It stressed that it was fulfilling treaty obligations and upholding the principles of collective security that had been so important to New Zealand since the Second World War. In the end, it was changing American policy, rather than protest activity, that led the New Zealand government to begin its own phased withdrawal of troops. The conflict and the anti-war movement ushered in a new era of debate about New Zealand's place in the world. There were calls for a more independent foreign policy that was not subservient to the United States. Participation in the Vietnam War fractured what had largely been a foreign policy consensus between the two major political parties, National and Labour. While National continued to accept the need for 'forward defence' and regional alliances, Labour leaders advocated new thinking in foreign policy to allow New Zealand to follow a more independent course in world affairs. The Vietnam War marked a turning point in the evolution of New Zealand's post-war foreign and security policies. In terms of national security, our combat involvement represented the culmination of a line of official thinking based on the ANZUS alliance, the perceived dangers of Asian communism, and the commitment to forward defence in South-East Asia. The outcome of the war prompted New Zealand to re-evaluate its alliance policy – most notably the forward defence strategy. The Vietnam experience was also important as a test of the country's relationship with the United States. The National government's policy avoided any confrontation with Washington – in stark contrast to New Zealand’s anti-nuclear stance in the 1980s. To that extent, the Holyoake government attained the central objective of its Vietnam policy: the alliance with the United States remained intact at the end of the war. But by then this alliance was less firmly rooted on a popular level, with significant numbers of New Zealanders criticising the country’s perceived subservience to the United States in security matters. For those who served in Vietnam, the war left a searing legacy. New Zealand Vietnam veterans, like their Australian and American counterparts, had to adjust to various consequences of fighting in an unpopular war. There has been much resentment within their ranks at perceived official and public indifference to the physical and psychological problems experienced by so many veterans due to exposure to Agent Orange and post-traumatic stress disorder. Another source of bitterness has been the sense that, unlike Second World War veterans, they did not receive adequate recognition for their professional service in a demanding theatre of operations. In recent years, there has been greater official sensitivity to these concerns. Parade 1998, a national reunion in Wellington in June 1998, received government assistance. In 2006, the New Zealand government signed a Memorandum of Understanding (MoU) with Vietnam veterans and their families. The MoU included a trust to support veterans’ children, a national reunion and official ‘welcome home’ parade named Tribute 08, and a formal apology for successive governments’ failure to address veterans’ concerns. The agreement also included an oral history project and the creation of a digital archive (www.vietnamwar.govt.nz) for Vietnam veterans and their families. Oral historians recorded more than 150 interviews between 2008 and 2012, and the digital archive continues to collect memories and memorabilia related to New Zealand’s Vietnam War. This web feature was originally adapted from Roberto Rabel's entry in The Oxford companion to New Zealand military history and produced by the NZHistory.net.nz team. In 2014 it was revised by Gareth Phipps. We have 7 events in history, 4 biographies, 9 articles, 1 comment related to Vietnam War.